A quick and easy dinner recipe with a mega kick of heat! 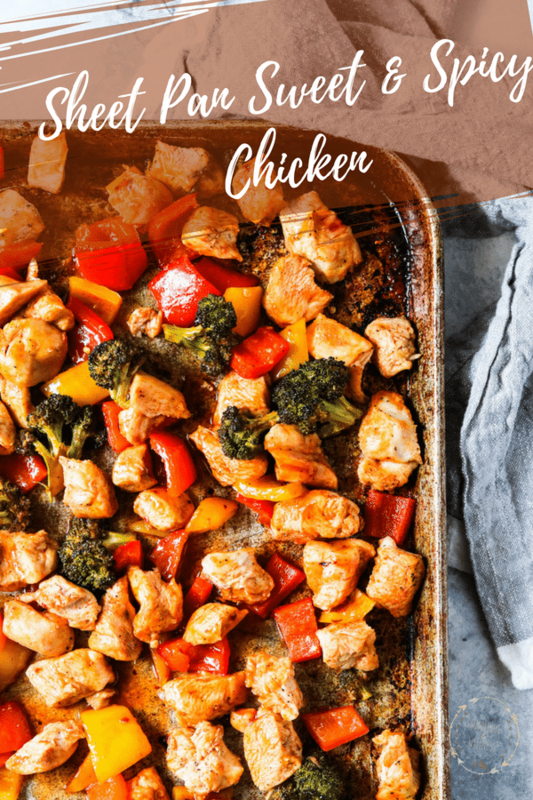 Another quick and easy dinner coming at you today with this sheet pan sweet and spicy chicken. Now, before we go any further, I want to emphasize SPICY because this recipe does pack some serious heat. I’ll include a few recommendations for lessening the heat, but if spicy is your thing then you will LOVE this recipe. 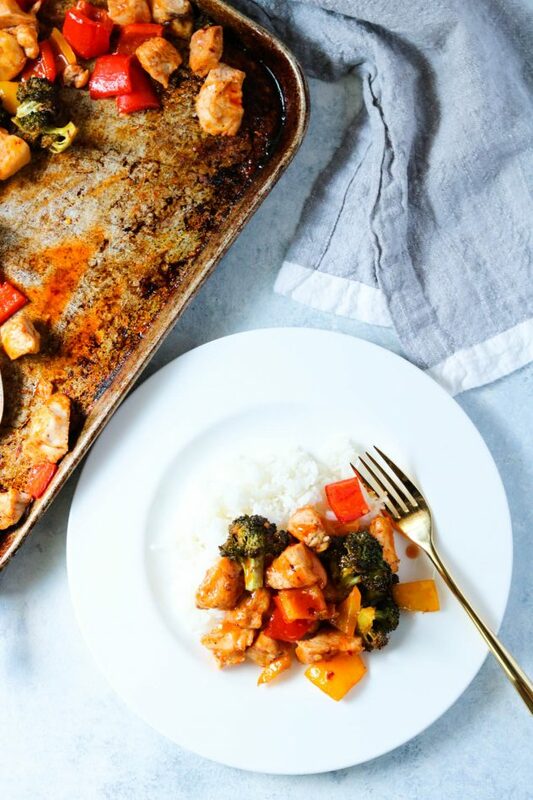 The best part of this recipe is it requires one pan, that’s it, a trusty sheet pan! 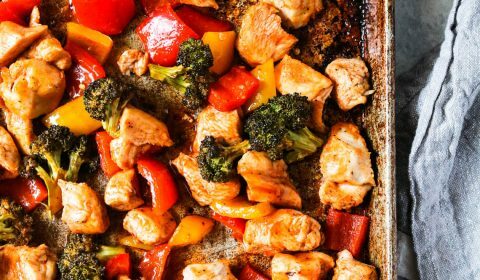 You’ll cut up the chicken and vegetables, toss them with a few spices and the sweet and spicy sauce and it’s ready for the oven. You can literally have this dinner in the oven and onto your plate in less than 30 minutes flat. 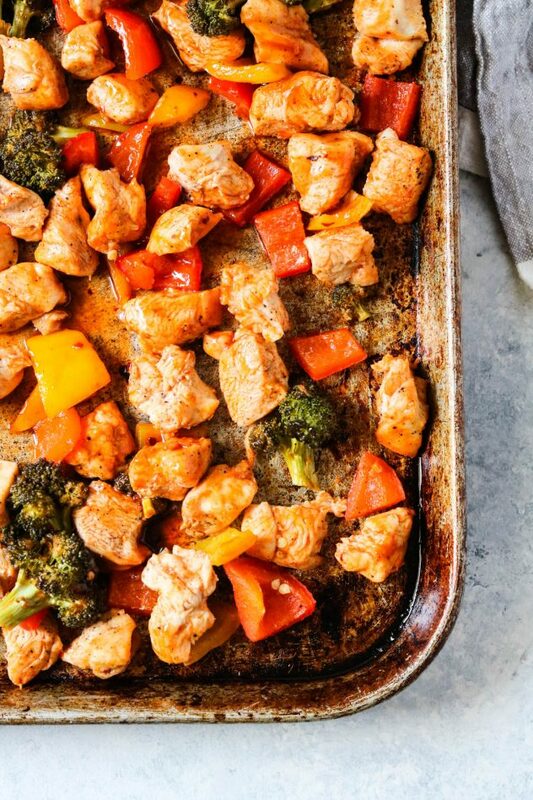 To speed this recipe up even further, you could cut up the chicken and vegetables the night before so that they’re ready to go straight into the pan and into the oven! One note on the chicken, you can either use boneless skinless chicken breasts or boneless skinless chicken thighs. I recommend thighs because they have more fat to them and don’t dry out as easy as chicken breasts. One of my biggest complaints about sheet pan chicken dinners is the fact that the chicken gets too dried out. If you go with chicken breasts you might consider covering the sheet pan with a sheet of parchment paper to keep some of that juice inside the chicken. Let’s talk about this sauce. There’s honestly only a couple of ingredients, Frank’s hot sauce, honey, brown sugar, salt and red pepper flakes. Seems doable, right? But, it’s hot, and all of my family members will confirm this. Ha! There are a couple of options for reducing the heat. Instead of Frank’s hot sauce, you could use sweet chili sauce. I find that it has less heat than Frank’s. Another option is to leave out the red pepper flakes. They seemed to take the heat up a notch (or two!) I do have a sweet orange sauce recipe that you could try as an alternative as well. If hot is a hard pass for you or your family, go ahead and try one of the alternatives mentioned here. If you’re cool with heat, give it a shot as is! Once the chicken is cooked through, remove from the oven and serve it up with some white or brown rice, or even quinoa, whatever you prefer. This will also help subdue some of that heat, too. I promise you, this is one ridiculously easy dinner recipe. Hopefully, it’s not too hot for you, and if it is I hope one of the alternatives will lessen the heat. I’m not trying to scare you off, but I always like to warn people when there’s some spicy heat to a dish. In a small saucepan, combine the sweet and spicy sauce ingredients and stir to combine. Bring to a boil, then reduce to low and simmer for 5 minutes. Remove from heat and let cool to thicken. 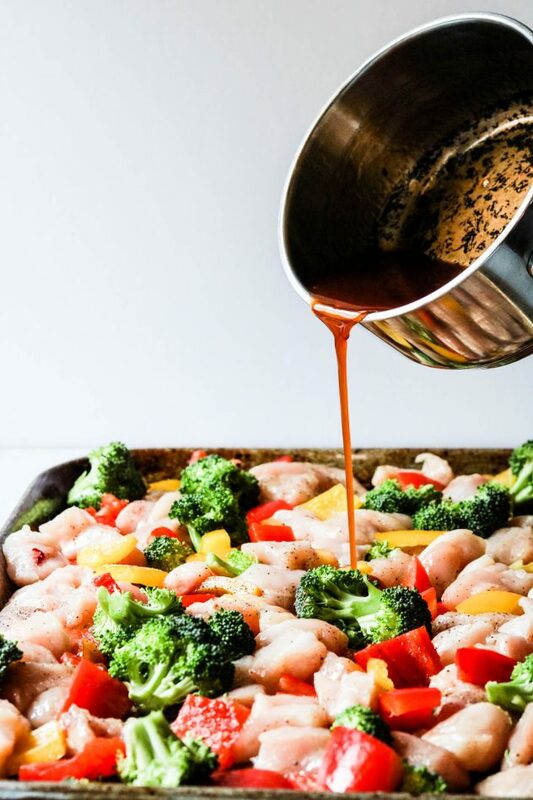 Spray your sheet pan with coconut oil. Cut up chicken into small cubes and arrange on sheet pan. Cut any stalks off of the broccoli florets and add to the pan. 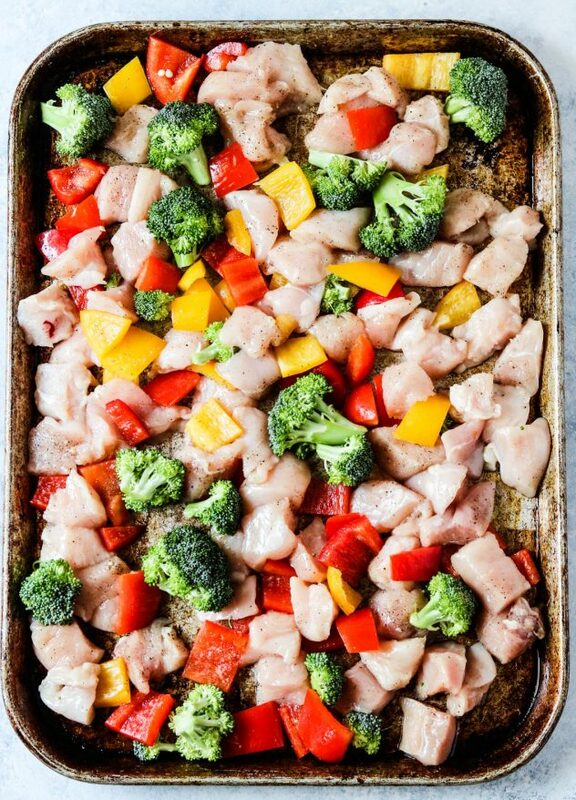 Chop the red and yellow peppers, add to the sheet pan. Sprinkle with ginger, salt, and pepper. 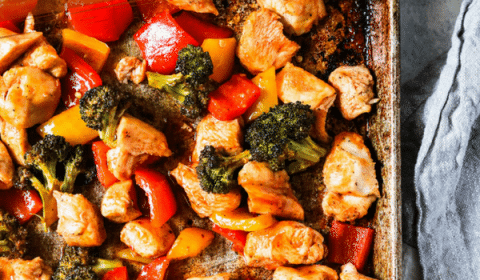 Using your hands, toss the chicken and vegetables to coat with the spices, then spread out evenly across the sheet pan. 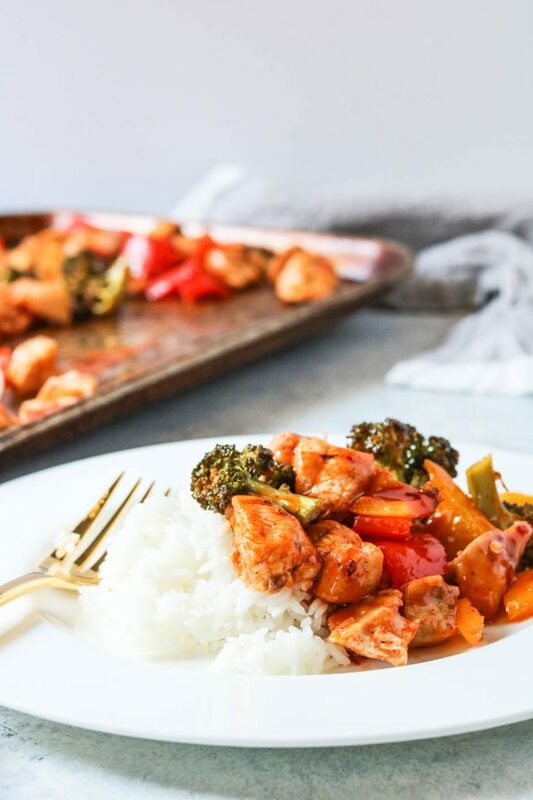 Pour one-half of the sweet and spicy sauce over the chicken and vegetables. Place sheet pan into the oven and cook for 20 minutes, tossing half-way through. While the chicken and vegetables are cooking, cook your rice according to package directions. When the chicken has finished cooking, remove the sheet pan from the oven. 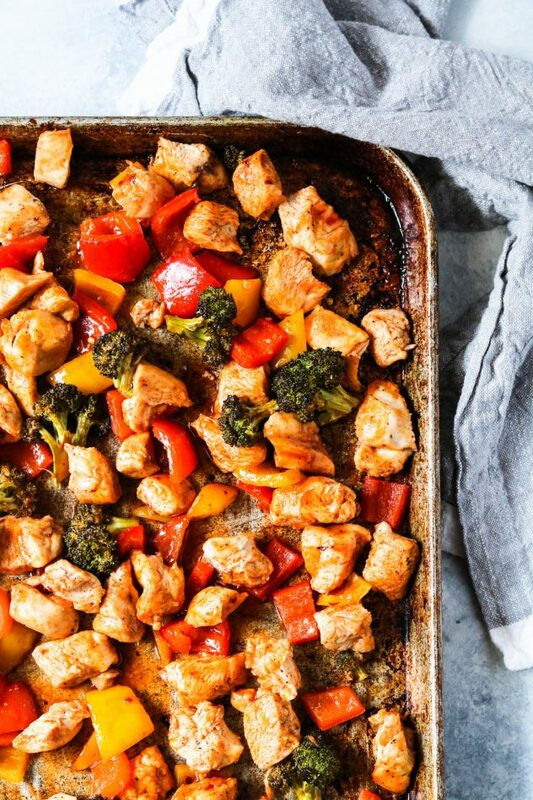 There may be a lot of extra juices on the sheet pan from the chicken and vegetables. You can drain some of this carefully off of the pan. After draining the excess juices, add the remaining sauce to the chicken and gently toss to coat. Serve with rice.